Greg / July 31, 2012 / Comments are off for this post. Here’s our list of the Top Five worst house cleaning chores. If you think we missed anything, add it in the comments. The first problem here is the inherent danger from being on a ladder. If you don’t have a ladder then you probably have to own some specialty cleaning tools like a telescoping pole. Getting a streak-free clean is difficult, but not impossible. Whether vertical or horizontal, wood or fabric, cleaning blinds is never a fun chore. Plenty of patience is always required for cleaning these pesky dust traps. If they have been neglected for too long be prepared to get covered in fine dust while cleaning. Bending over constantly to get at those nooks and crannies makes for a sore back, especially when there is furniture to move. There is only one word to describe dirty tile grout, Yuck! Deep dirt and mildew are grout’s best friends. Your bathrooms and other grout areas are likely due for a deep cleaning. Putting this off will only make it worse in the future. Years of sticky spills, dust, and dead insects are just some of the horrors that may be lurking underneath your refrigerator. Refrigerators are heavy and difficult to move. To get it all the way out for cleaning you will probably have to disconnect the water line to it as well. You love the air circulation provided by the ceiling fan in your great room, but have you ever tried cleaning it? How would you even go about it? Watch for falling dust and be careful not to damage the fan. What is the state of your home? Call the experts at Clean Conscience to take care of these tedious cleaning tasks. Greg / July 27, 2012 / Comments are off for this post. As an animal lover I know that a pet is like a family member, and like a family member you want to make sure they are as safe as possible. Getting vaccinations, buying certain foods for a healthy diet, or even just taking them for walks so they get exercise, are all ways we try to protect our “other family members”. Another way you can help protect them is by using natural or “green” cleaning items in your house and on your pets. In previous blogs I’ve mentioned that things like vinegar, baking soda, and lemons can be used to do anything from cleaning an oven, grill, or toilet, to putting the shine back on chrome. These items can also be used to safely clean up after your pet. The next time your pet has an accident on your rug, instead of using traditional cleaners, try cleaning up the mess by scrubbing the area with club soda as soon as possible and let it dry. Then sprinkle a bit of baking soda on the area and let it sit to help control the odor. After about an hour vacuum the area thoroughly. If the stain is still there you can spread lemon juice over the area and let it soak in for about 20 min. After the stain is removed, use a mixture of vinegar and water to remove the odor. If your pet is anything like the dogs I’ve had in my life, then they probably don’t like taking a bath. There is a natural solution that won’t get water all over the bathroom. If your pet is starting to smell a little funky, you can dry bathe it using baking soda. Sprinkle your pet’s coat with baking soda and rub it in with your hands. Then, use a brush and gently spread the baking soda through the fur until the baking soda is gone. The best part is, even if they lick their coat, they won’t get sick because there are no harsh chemicals involved. Greg / July 24, 2012 / Comments are off for this post. “The John”, “the head”, “the porcelain throne”; no matter what funny little nickname you use to describe your toilet, there’s a good chance that when it comes time to clean it, you’re less than thrilled. Cleaning out your toilet can be especially tedious when you have to deal with all of the harsh chemical smells that come with using a traditional toilet cleaner. There is another way to clean your toilet which is safer for the environment and easier on your scrubbing arm and your nostrils. The “green” way of cleaning sometimes also seems to be the easiest in the end. In this case, all you need to clean your toilet is baking soda, castile soap (vegetable based liquid soap), white vinegar, and an empty squeeze bottle (a cleaned out ketchup or mustard bottle will work fine). Using a funnel (or just being very careful), add about 1/4 cup of baking soda to the squeeze bottle. Then add the castile soap to the bottle as well. Add as much soap as you’d like until you like the consistency. Once you have the baking soda and soap mixed, simply squirt the combination along the underside of the rim of the toilet as you would a regular cleaner. Let sit for a minute or two and then add the vinegar. The reaction between the vinegar and baking soda will do the cleaning so you don’t have to scrub. Afterwards, simply flush and you should have a nice clean toilet without having to scrub with harsh chemicals. Greg / July 20, 2012 / Comments are off for this post. When most people decide to “go green”, they are usually doing so with improving the environment outside of the home on their mind. By recycling, using biodegradable products, reducing pollution, and just helping to maintain the ecological balance on Earth we can help to create a cleaner, healthier environment. While improving life outside of the home is reason enough to decide to “go green”, it is not the only benefit. When you think of pollution, most people think of places like the L.A. freeway or The Lincoln Tunnel in New York City. But what you don’t think of is your very own home. According to the U.S. Environmental Protection Agency, indoor air pollution can sometimes be up to 30 percent worse than outdoor levels. A large reason for this is because of the cleaning products we use to clean our homes and the harsh chemicals they contain, which can pollute the air and even make you sick. According to research, many common household cleaners contain compounds that can lead to asthma, infertility, eczema, and even some birth defects…..not to mention just poor air quality. The way to combat this problem is to use natural cleaners (such as vinegar, baking soda, etc…) or use green cleaning products (and if you hire a cleaning service, be sure to hire one that uses green products in lieu of harsh chemicals). So, while “going green” not only protects the environment from chemicals and harsh pollutants, it can also keep your home and family safer and healthier. 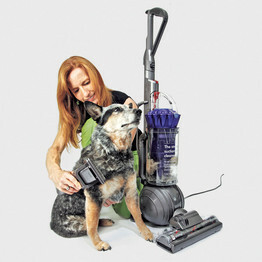 Would you vacuum your dog? Greg / July 19, 2012 / Comments are off for this post. How Often Should You Get Your Home Cleaned? Greg / July 17, 2012 / Comments are off for this post. A frequently asked question by home owners who are hiring a cleaning service for the first time is, “How often should you guys come?”. As much as a cleaning service would love to come do a job everyday, this most likely is not necessary. To decide on how often you should have your home cleaned, you should start by figuring out how often you yourself clean your home. Not just a quick tidy up either, a real cleaning, with vacuuming, scrubbing the toilet, polishing furniture, etc.. You should also consider other family members, do they help keep the place clean or do they contribute to the mess? You need to look at what can be done between cleaning visits in order to get an idea of how often you need to hire outside help. Another important factor which you must consider is budget; although you may want (or need) to have a weekly cleaning, you may have to stay within a certain dollar amount. The average cost of having a cleaning service come is between $85-$165 (although prices may vary based on property size or location). Most cleaning services are scheduled weekly, bi-weekly, or monthly. The most common service is bi-weekly, but if you find yourself spending a lot of time cleaning more than once a week, then a weekly schedule may be a good idea. Greg / July 13, 2012 / Comments are off for this post. When you turn on your oven to preheat, does your home fill with the scent of casseroles past? If so then it is probably time to clean your oven. The thought of grabbing a sponge, getting on your hands and knees and scrubbing away using harsh chemicals with overwhelming fumes, would make most people say, “forget it”. Well, here are a few natural remedies for cleaning your oven, without having to use harsh chemicals. 1. “Baking Soda”- Make a paste out of equal parts baking soda and water. Spread the paste on the oven and let sit overnight. You don’t even have to scrub. 2. “Vinegar”- Fill a spray bottle with vinegar and spray the inside of the oven (spray a decent amount). Let it sit for about 2-3 hours, then simply remove using warm water. Many ovens are now self-cleaning ovens. If you happen to have one of these ovens, make regular use of the self-cleaning cycle to burn off left over grease and grime, and you won’t have to clean as often. Greg / July 10, 2012 / Comments are off for this post. Allergy season can be a real pain. The coughing, trouble breathing and sneezing seemed to be especially bad this year do in large part to our very mild winter. Another cause for these symptoms can also be from poor air quality. A home overcome with dust, mold and other common allergens may cause you to sneeze, cough, etc…. 1. “Monitor humidity levels”-Most allergens are caused by moist, humid air. Using a dehumidifier in moist places in the home (like the basement) can help. 3. “Keep a clean house”- Cleaning your house once a week will cut down on dust, pet dander and other allergens. Greg / July 6, 2012 / Comments are off for this post. Here is an informative article from Home Cleaner Magazine, on how to handle the sometimes awkward situation of confronting a lackluster cleaning service. What should you do when the service you are receiving from your home cleaning service is not up to par? How should you handle it; what steps should be taken? Communication is key- pick up the phone let the owner/ manager know what is going on with your cleaning. They should welcome your feedback! Let’s face it; no one likes to make those phone calls, the ones where you have to complain to someone about what they are, or in this case likely aren’t, doing. It is human nature to not like confrontation; it would be much easier in a perfect world where everyone did what they should do, or at least what you think they should do. However, sometimes “issues” will come up with dealing with a service oriented company. The fact is, in service businesses for now, it is people providing the service, not robots, so no matter how professional a home cleaning may be, no matter how great the recruiting, hiring, and training process may be; sometimes systems break down and items can fall between the cracks, causing lack luster results. First, give the situation some objective thought before you immediately pick up the phone to complain. Is this an isolated event; has the cleaning been good up until now, or is it an ongoing problem that has been building? Was the quality good; then, it began to taper off? Second, how much does it really matter to you; is it just a small item that you “just think should be done,” or is it a serious issue with overall quality and the value you are receiving? If it is a one time isolated mishap, or likely over sight on the cleaning team’s part, then either email or call the service owner or manager directly. Let them know what as missed or specifically what you are not happy with; bring it to their attention. Any professional service should be overwhelmingly grateful for your gift! If you are willing to take the time to discuss the issue and if you sincerely want it to improve or be addressed because you want to keep the service, then that should be accepted as a gift. For every one client that takes the time to call and give input, there are 10 more unhappy clients who won’t bother to share, which is the only way real issues can be addressed and corrected. If the service owner/manager is overly defensive and challenges you on what you are telling them, then MOVE ON and find a new service. Let them know if it is just a simple issue you are bringing to their attention that you want addressed on the next visit, or if it is a serious quality issue which the service should address immediately by sending the team back. Give the service the chance to correct what was missed and move forward; if the same issue, or other serious issues, appears, move on and find another service. On the other hand, if YOU the client is “in the wrong”, then be prepared for the service to cancel on you. Not every relationship is a fit. All too often customers will let small issues go until those issues build up and then perhaps on a bad day all of the small issues that individually would not add up to much, all of a sudden become so much that the clients abruptly call and just cancel the service. This can be extremely frustrating to home cleaning companies that are working hard to build and run professional businesses that provide excellent service; the relationship after all must be a two way partnership if it is to be successful long term. This information is brought to you by the Verified Home Cleaning Pro, an independent screening and verification program for professional home services. Service owners who enroll and participate in the program are required to meet stringent criteria and are screened and approved to be accepted into the program. Visit www.verifiedhomecleaningpro.org for complete information on the program and to locate a provider in your area. If you are a professional home cleaning company, contact us about enrolling today to ensure you are in the network of service owners in your area participating in this program. Greg / July 4, 2012 / Comments are off for this post. The Humane Society of Boulder Valley has some great tips on keeping pets safe during fireworks season. We hope you and your family have a safe holiday! While firefighters are still working to extinguish the Flagstaff Fire, we remind you that Boulder Police announced yesterday a zero-tolerance for fireworks violations to reduce fire danger and protect our beautiful city and our homes. The dogs and cats of our community would applaud their decision if they could because many pets find the noise and commotion of fireworks very distressing. Animals have extremely sensitive hearing. To a dog or cat, even the distant sound of fireworks can be alarming. Leave pets at home instead of bringing them to public picnics, fairs and fireworks display. When walking dogs, keep them on a leash at all times in the event they panic due to a sudden noise. Keep pets away from the noise in a quiet, sheltered and escape-proof area. Turning on a radio or television will help drown out outdoor noises. Do not leave an anxious dog alone in a yard or in a house with access to a screened or open window. Keep all cats – even indoor/outdoor cats – indoors. A screened porch is a safe compromise for a few days. Composure is an over-the-counter tasty, chew with a calming formula that helps to reduce stress and anxiety in dogs and cats. It is available for purchase at the Humane Society of Boulder Valley Veterinary Clinic. Every fireworks season we find our shelter filled with lost pets. According to 24PetWatch™ (our microchip company) call center statistics, lost pet calls increased 69% during the 1st and 4th of July festivities in 2011. We receive many dogs and cats who aren’t wearing tags, who aren’t microchipped, and even worse, pets who have been hit by cars and seriously injured. Animals with microchips (and updated contact information) and wearing identification can often be immediately returned to their homes. To report a lost or found pet, call the Humane Society of Boulder Valley at 303-442-4030 or click here to file a lost report online. If we are closed, call the Boulder Police Department at 303-441-3333 or your local animal control. Pets who have been reported found or received at the Humane Society are listed on our website. Our website lists all of the animals brought to us as stray, as well as animals who are reported “found” but have not been turned in to the shelter. The Humane Society of Boulder Valley will be closed on Wednesday, July 4th. We will reopen Thursday morning at 11:00 am.